Do changes in effort-reward imbalance at work contribute to an explanation of the social gradient in angina? Aims: To determine whether an increase in effort-reward imbalance over time increases the risk of angina, and whether such increases are associated with lower occupational position. Methods: Effort-reward imbalance (ERI) at work was measured in the Whitehall II occupational cohort of London based civil servants at baseline (1985–88) and in 1997. Coronary heart disease was measured in a self-reported health questionnaire by combining the Rose Angina Questionnaire with doctor diagnosed angina in 2001. Results: Among men, increase in ERI over time was associated with an increased risk of incident angina. Moreover, as increases in ERI were more common among lower grade civil servants, change in imbalance, to some extent, contributed to explaining the social gradient in angina. Among women, increases in imbalance were not associated with risk of angina, and therefore did not contribute to the explanation of the social gradient. Conclusions: Reductions in effort-reward imbalance at work may reduce the risk of coronary heart disease among men. The Whitehall II study is a prospective investigation of socioeconomic, psychosocial, behavioural, and biomedical health determinants in a cohort of British civil servants.11 Previous analyses have shown that employees from lower employment grades and with greater effort-reward imbalance from the first phase (1985–97) of the Whitehall II study have higher risks of incident CHD after 10 years (by the fifth phase of the study, 1997).9 This paper proposes to extend this analysis further in two ways—by looking at new CHD (self-reported) health outcomes after the fifth phase, and by analysing the change in employees’ effort reward imbalance from phase 1 to phase 5, to see whether this predicts incident CHD by 2001. As the latest phase of the Whitehall II study for which data are available (phase 6) is a questionnaire phase, incident CHD could only be examined in terms of self-reported doctor diagnosed angina or the Rose Angina Questionnaire. The relation between effort-reward imbalance and socioeconomic position has been found to be inconsistent. This is mainly due to the fact that the mean level of effort increases with higher socioeconomic position, whereas the mean level of reward decreases with lower socioeconomic position.12 Although there are exceptions in specific occupational groups and although results may vary according to the operational definition of effort-reward imbalance, this general trend results in an inconsistency of the association of imbalance with socioeconomic status. In some studies, an inverse social gradient of the ratio was documented,13,14 while in at least two reports an opposite trend was obvious.9,15 However, none of the studies measuring work stress by this model used repeated measures of effort-reward imbalance. It is possible that change in the level of work stress over time is associated with socioeconomic status, leaving those in lower positions with a lower chance of reducing their effort-reward imbalance at work. Increased effort-reward imbalance at work among men is associated with increased risks of angina among men. Those in higher occupational classes are more likely to reduce their exposure to effort-reward imbalance at work over time compared to those in lower occupational classes. Is there a social gradient of angina incidence, as measured by occupational class? Is effort-reward imbalance at work, as assessed at study onset, associated with an increased risk of angina, even after adjusting for the social gradient? Does an increase in effort-reward imbalance over time increase the risk of angina, even after adjusting for initial level of effort-reward imbalance? Does occupational class predict changes in effort-reward imbalance? Do higher grade employees decrease and lower grade employees increase or maintain their effort-reward imbalance over time? Hypotheses 1 and 2 have been examined before in other studies, including the Whitehall II study. Hypotheses 3 and 4 are new hypotheses that have not been examined in previous studies, to the authors’ best knowledge. The Whitehall II study is a prospective investigation of socioeconomic, psychosocial, behavioural, and biomedical health determinants in a cohort of 10 368 male and female British civil servants.11 Data collection started in 1985–88 (phase 1) and was continued to 2001 (phase 6). At phase 6, data were available from 7344 participants, but for some variables such as work conditions, the effective sample size was much smaller as the analysis was restricted to those who were still in employment at phase 5. Of the 5002 respondents who were in employment at phase 5, 3697 answered all the questions on the effort-reward imbalance questionnaire. Respondents who were still in employment at phase 5 but did not answer all the questions on the effort-reward imbalance questionnaire were older and from lower employment grades. Reductions in effort-reward imbalance at work may reduce the incidence of heart disease among men. The design and implementation of theory based intervention measures on reducing adverse psychosocial work conditions is indicated. Effort-reward imbalance at work: The model of effort-reward imbalance at work was measured, at phase 5, by a psychometrically validated questionnaire containing 23 Likert scaled items.12 This questionnaire contains three scales: a scale measuring effort at work (6 items), a scale measuring reward at work (11 items, composed of three subscales: “esteem”, “salary and promotion”, “job security”), and a scale measuring the personal pattern of coping with work demands, “over-commitment” (6 items). The first two scales measure the extrinsic component of the model (perceived demands and rewards at work), whereas the third scale measures the intrinsic component of the model (the psychological coping pattern). The central hypothesis of the model assumes a linear association of effort-reward imbalance with health: the higher the imbalance the higher the health risk. To estimate this imbalance, a ratio of the two scales “effort” (e) and “reward” (r) is constructed according to the formula e/r · c, where c is a correction factor for unequal number of items in the enumerator and denominator. As effort-reward imbalance was measured by non-identical instruments at phases 1 and 5, convergent validity analyses were examined to see if the associations of both measures with age, self-rated health, and job strain18 were similar. Previous analysis has shown that effort-reward imbalance decreases with age9,12,13 and is associated with poorer self-rated health.19–21 Both measures of effort-reward imbalance (at phases 1 and 5) showed similar associations with age and self-rated health. Furthermore, the correlations between job strain (that is, high demands and low control) and effort-reward imbalance at both time points were remarkably similar: 0.40 at phase 1 and 0.42 at phase 5. This suggests that the measures of effort-reward imbalance at both time points are comparable. Change in the effort-reward imbalance ratio was measured by subtracting the phase 5 score from the phase 1 score. Thus, a higher value of the difference score implies a greater reduction in the effort-reward imbalance from phase 1 to 5, and vice versa. This score was tertiled for some of the descriptive analyses: effort-reward imbalance increased, remained the same, and decreased (although these titles do not strictly describe the groups as very few respondents reported higher imbalance at phase 5 compared to phase 1). Occupational class was measured by the hierarchical measure of civil employment grade, distinguishing six grades from highest (permanent secretary) to lowest (administrative officer, assistant) occupational positions.11 For ease of presentation for the figures, this variable was recoded into three groups—high, middle, and low grades. Risk factors for phase 6 angina (obesity—measured by the body mass index, and systolic blood pressure) were measured at phase 5. Other cardiovascular risk factors were also examined (diabetes, diastolic blood pressure, smoking, and physical activity), but these were not significantly related to incident angina from phase 5–6, and so were dropped from the analyses. Path diagram showing associations between employment grade, effort-reward imbalance at two time points, and angina. Evidence for path D would suggest that change in effort-reward imbalance (or imbalance at phase 5 adjusted for imbalance at phase 1) affects angina. This basic pathway model was expanded to include age (at phase 1), obesity (at phase 6), and blood pressure (at phase 6). Age was correlated with the phase 1 variables (employment grade and effort-reward imbalance) and affected effort-reward imbalance at phase 5 and angina at phase 6. Obesity and blood pressure (measured at phase 5) affected angina at phase 6 and were correlated with the other variables in the model. To examine this pathway model, MPlus software was used which enables path analysis with categorical outcome data. The pathways were analysed using weighted least squares probit regressions, rather than maximum likelihood logistic regressions. In order to handle patterns of missingness in the data, (including drop out from the study at phase 6 as well as missing effort-reward imbalance data at phase 5), MPlus provides maximum likelihood estimation under MCAR (missing completely at random) and MAR (missing at random) assumptions. In the analysis, missingness is allowed to be a function of the observed covariates, age and employment grade, as older respondents and those from lower grades were more likely to be missing at phase 6 as well as have missing effort-reward imbalance data at phase 5. The outcomes (including missing data) are modelled conditional on the covariates and the covariates have no distributional assumption. In table 1, the percentage of new cases of angina is given by employment grade (at phase 1), tertiles of effort-reward imbalance at phases 1 and 5, and the difference score between the two (separately for men and women). There were 206 cases of incident angina (139 men, 69 women). Although 3697 respondents filled in the effort-reward imbalance questions at phase 5, not all of them were followed up at phase 6, resulting in the smaller total numbers for some of the cross tabulations. Men and women from lower employment grades were more likely to have incident angina (table 1). Among men, a higher degree of effort-reward imbalance at phases 1 and 5 was associated with a higher risk of incident angina. However, among women, this association was only evident at phase 1. At phase 5, there does not appear to be much association between effort-reward imbalance and incident angina among women. A decrease in effort-reward imbalance was associated with lower risks of angina among men, but not among women. Relatively more men and women from lower grades experienced an increase in effort-reward imbalance. 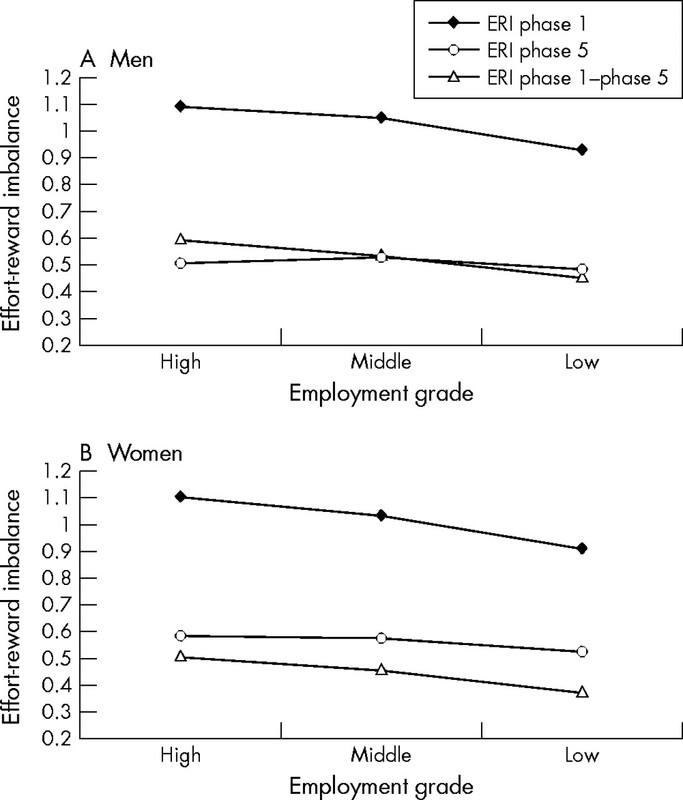 Figure 2 shows the mean effort-reward imbalance ratio at phases 1 and 5 and the difference score between the two measures (phase 1 score minus phase 5 score) by employment grade, separately for men and women. There is a clear social gradient in effort-reward imbalance at phase 1 for both men and women, showing that those in higher employment grades have higher imbalance. However, at phase 5, this association is not so strong and the linear trend in effort-reward imbalance scores at phase 5 by employment grade is not as evident as for the phase 1 scores. When we look at the difference score, we see some evidence of a linear trend by employment grade. This suggests that those in the higher employment grades had reduced their imbalance (by phase 5) to a greater extent than those in the lower employment grades. The difference between the imbalance scores was greater for those in the higher grades. These mean trends were similar for men and women. As effort-reward imbalance has decreased, on average, from phase 1 to 5, hypothesis 3 can be restated as “does a reduction in effort-reward imbalance, over time, reduce the risk of angina?”. Mean effort-reward imbalance (ERI) at phases 1 and 5 and the difference score by employment grade; Whitehall II study, men and women separately. Figure 3 shows the results of the empirical test of the pathway model displayed in fig 1. All path coefficients in the figure are standardised probit coefficients. Among men, higher effort-reward imbalance at phase 5 is associated with incident angina. There is little evidence of a direct effect of imbalance at phase 1 on incident angina, although the indirect effect through imbalance at phase 5 was statistically significant (standardised probit coefficient of 0.17 with 95% confidence intervals from 0.08 to 0.25). This suggests that there is little evidence for hypothesis 2 (that effort-reward imbalance affects angina, adjusted for employment grade). However, when effort-reward imbalance at phase 5 is taken out of the model (that is, the path from imbalance at phase 5 to angina is set at zero), imbalance at phase 1 significantly affects incident angina, thus providing some evidence for hypothesis 2. Standardised probit regression coefficients for the model in fig 1; Whitehall II study. **p < 0.01. Employment grade had direct and indirect effects (through imbalance at phase 5) on incident angina. Although the standardised indirect effect of employment grade on incident angina was small (0.01, with confidence intervals from 0.00 to 0.01), it was statistically significant at the 95% level. In other words, the effect of grade on angina is mediated, in part, by the effect of grade on effort-reward imbalance at phase 5. The negative correlation between employment grade and imbalance at phase 1 suggests that those in lower grades had lower effort-reward imbalance scores at phase 1, while the positive effect of grade on imbalance at phase 5 suggests that lower grades had higher imbalance scores at phase 5. 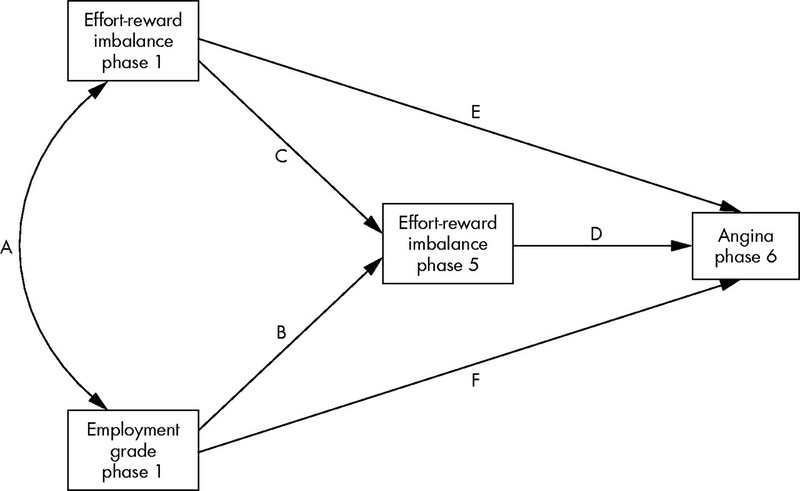 Effort-reward imbalance at phase 1 was moderately correlated with imbalance at phase 5. Among women, effort-reward imbalance at phase 5 appears to have little effect on angina. Imbalance at phase 1 and employment grade directly affect angina; there was little evidence of indirect effects through imbalance at phase 5. In summary, among women, empirical support is restricted to hypotheses 1 and 2 but there is little evidence to support hypotheses 3 and 4. Systolic blood pressure and body mass index were positively associated with incident angina (not shown in fig 3), although the only statistically significant association was between blood pressure and angina for men. The probit coefficients in fig 3 for incident angina were converted into probabilities of incident angina for a person aged 45 at phase 1, with a BMI of 25 and systolic blood pressure of 120 mm Hg at phase 5 (table 2). These probabilities are calculated for a series of hypothetical people who had different combinations of these hypothesised minimum and maximum scores of effort-reward imbalance at phases 1 and 5. Not all such combinations are represented in the empirical data matrix of this study sample. Men and women who had consistently high effort-reward imbalance at phases 1 and 5 had the highest probability of incident angina. This was especially true for those in the lowest grades. Men who reduced their effort-reward imbalance (that is, those who had high imbalance at phase 1 and low imbalance at phase 5) had a lower probability of angina than those who had consistently high imbalance. Similarly, men who increased their effort-reward imbalance had a higher probability of angina compared to those who had consistently low imbalance or those who had decreased their imbalance (supporting hypothesis 3). Among women, those who reduced their effort-reward imbalance had similar probabilities of angina as those who had consistently high imbalance. Women who increased their imbalance from phase 1 to phase 5 has similar probabilities as those who had consistently low imbalance (not supporting hypothesis 3). 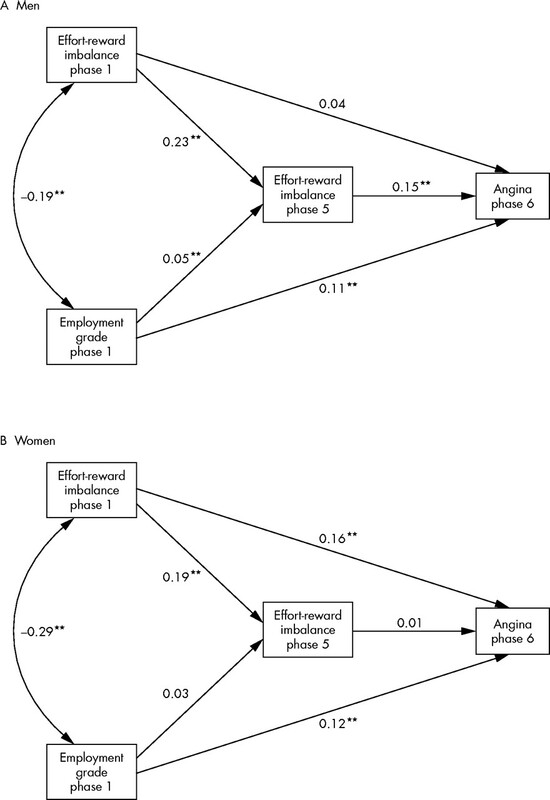 This suggests that effort-reward imbalance at phase 5 does not affect incident angina and that effort-reward imbalance at phase 1 has a more important effect on incident angina among women from lower employment grades than imbalance at phase 5. To our knowledge, this is the first report of adverse health effects produced by increases in adverse psychosocial work environments over time in terms of effort-reward imbalance. Among men, those who had increased their effort-reward imbalance had higher probabilities of incident angina than those whose imbalance had remained low or had reduced. This effect (of an increase in imbalance affecting angina) was not really evident for women. Due to methodological reasons results are restricted to the extrinsic component of this work stress model and, thus, may result in a potential underestimation of observed effects. Furthermore, among men, the social gradient in angina appears to be explained, in part, by the social gradient in the change in effort-reward imbalance. Although men and women in higher grades had higher imbalance to start with, they were more likely to reduce their imbalance later on. This resulted in a social gradient in the change in effort-reward imbalance (subtracting their later imbalance scores from their scores at the first time point). For men, those who had reduced their imbalance had lower probabilities of incident angina than those who had increased their imbalance (for women, this was not the case). As higher grade men were more likely to reduce their imbalance, the effect of employment grade on angina appears to be mediated, in part, by its effect on changes in effort-reward imbalance. The fact that reductions in effort-reward imbalance contribute to the explanation of the social gradient in angina needs further consideration. As was shown, reductions were more frequent among civil servants from higher occupational grades. However, at phase 1, effort-reward imbalance was more pronounced among higher grades in this cohort who, subsequently, experienced the relatively largest reductions in stressful experience at work. How can this observation be explained? While several studies show higher mean scores of the effort scale in higher status groups, a reverse trend is usually observed with respect to the scores of the reward scales.12 In this study, comparable items measuring reward within the two questionnaires heavily focused on aspects of occupational career, in particular promotion prospects. It is possible that those in higher social positions obtain greater rewards from their work at a later stage in their career and that years of heavy investments are required in order to get promoted appropriately. Some of this “delayed gratification” may have been captured by differences in the two measurements of occupational rewards between phases 1 and 5. In contrast, lower grade civil servants experience very few promotion prospects as most of them are locked in a social position without upward mobility. It is therefore likely that a sense of relative deprivation with regard to occupational rewards grows over time that is reflected in a mean increase in the effort-reward difference score between phases 1 and 5. Among women, there is evidence of a social gradient of angina. There is also some evidence of a direct effect of effort-reward imbalance at phase 1 on angina, although little effect of changes in imbalance on angina. However, the effect of employment grade on angina does not appear to be mediated through effort-reward imbalance at either time point. Although there is some evidence indicating that an adverse psychosocial environment outside work is likely to be more important in explaining CHD among women,25 any conclusion about the effect on effort-reward imbalance on CHD from this study may be premature due to the small number of incident angina cases among women, as well as gender differences in the self-report of angina (women are less likely to present angina symptoms to their doctor). The association of effort-reward imbalance, assessed at study entry, with incident angina in men, is in agreement with previous findings from prospective studies. Results on this association among women are less consistent. Whereas several studies documented similar effects in men and women,8,9,14 other investigations, in addition to this study, failed to find an association of an adverse psychosocial work environment with CHD in women.26,27 This inconsistency could possibly be explained in terms of gender roles.28 Threats to work related social status are most stressful to the traditional male gender role as they endanger its core social identity, whereas women, in general, have alternative options of securing their social identity.29 Moreover, as pointed out earlier, an adverse psychosocial environment outside work, the home, may elicit more stressful reactions in women than the work environment. The elucidation of gender role related susceptibility to CHD following exposure to adverse psychosocial environments clearly requires further investigation. A further limitation of the present study concerns the measurement of an adverse psychosocial work environment. As explained, the two measurements of effort-reward imbalance were not identical, and the intrinsic component of the model, over-commitment, was not included. Given the independent contribution of this latter variable to the estimation of CHD risk,9,29,35 we cannot rule out that reported effects are underestimated. Thus, a replication of findings based on identical measures and on the complete questionnaire defines a task for future research. The reduced sample size resulting from restricted data available at phases 5 and 6 is a further issue of potential concern. Respondents from lower employment grades were more likely to have dropped out by phase 6, resulting in a possible under-estimation of the social gradient in CHD. Older respondents in employment were less likely to fill in the effort-reward imbalance questionnaire at phase 5, compared to younger respondents in employment. This may have resulted in an under-estimation of the effect of age on the outcome variables in the analyses. The statistical program used in the analysis, MPlus provides maximum likelihood estimation under missing completely at random and missing at random assumptions. This helps deal with the problem of drop out from the cohort by including predictors of drop out such as age and employment grade in the analysis. An often stated additional criticism concerns the limited number of confounders included in psychosocial research on somatic diseases, such as CHD. It is argued that residual confounding may underlay the reported associations of psychosocial variables with somatic disease, thus precluding any firm evidence.37 It is hard to see how this critique can be maintained given the substantial replication of findings of an independent and significant contribution of distinct psychosocial variables to risk estimation of CHD (such as demand- control and effort-reward imbalance at work). These effects are sometimes attenuated by inclusion of multiple behavioural and biomedical risk factors, but it is rare that they are lost as a result of confounder control. In this paper, smoking, physical activity, body mass index, blood pressure, and diabetes were analysed as potential confounders (analysis not shown), but none of these risk factors was significantly associated with incident angina at phase 6. It is possible that increases in effort-reward imbalance at work result in increases in these cardiovascular risk factors (that is, they are mediators, rather than confounders), but such an analysis is not yet possible on the Whitehall II data. Finally, the findings of this study are restricted to a specific occupational group, male and female civil servants in the United Kingdom. It is uncertain to what extent they can be generalised to other occupational groups and countries. However, as associations of effort-reward imbalance at work with CHD have been observed in other occupational groups, such as blue-collar workers in Finland8,38 and in Germany,35 it is unlikely that civil servants define a special case in this regard. In conclusion, despite the limitations mentioned, this investigation found consistent associations of effort-reward imbalance at work at study entry, and of changes in imbalance over time, with risk of incident angina in male civil servants. Furthermore, the social gradient in angina among men is explained, in part, by change in level of work stress over time according to occupational class. These findings contribute to a considerable amount of evidence on the detrimental health effects produced by an adverse psychosocial work environment. Given this evidence, the design and implementation of theory based intervention measures seems to be a timely challenge. The Whitehall II study has been supported by grants from the Medical Research Council; British Heart Foundation; Health and Safety Executive; Department of Health; National Heart Lung and Blood Institute (HL36310), US, NIH: National Institute on Aging (AG13196), US, NIH; Agency for Health Care Policy Research (HS06516); and the John D and Catherine T MacArthur Foundation Research Networks on Successful Midlife Development and Socio-economic Status and Health. The authors thank all participating civil service departments and their welfare, personnel, and establishment officers; the Occupational Health and Safety Agency; the Council of Civil Service Unions; all participating civil servants in the Whitehall II study; and all members of the Whitehall II study team. The authors also thank Annie Britton for helpful comments on an earlier draft of this paper. Stansfeld S, Marmot M, eds. Stress and the heart. Psychosocial pathways to coronary heart disease. London: BMJ Books, 2002. Schnall PL, Belkic K, Landsbergis P, et al. The workplace and cardiovascular disease. Occup Med2000;15:1–374. Marmot MG, Bosma H, Hemingway H, et al. Contribution of job control and other risk factors to social variations in coronary heart disease incidence. Lancet1997;350:235–9. Karasek RA, Theorell T. Healthy work. Stress, productivity, and the reconstruction of working life. New York: Basic Books, 1990. Siegrist J. Adverse health effects of high effort-low reward conditions at work. J Occup Health Psychol1996;1:27–43. Hemingway H, Marmot M. Psychosocial factors in the aetiology and prognosis of coronary heart disease: systematic review of prospective cohort studies. BMJ1999;318:1460–7. Kivimaki M, Leino Arjas P, Luukkonen R, et al. Work stress and risk of cardiovascular mortality: prospective cohort study of industrial employees. BMJ2002;325:857–60. Kuper H, Singh-Manoux A, Siegrist J, et al. When reciprocity fails: effort-reward imbalance in relation to CHD and health functioning within the Whitehall II study. Occup Environ Med2002;59:777–84. Pappas G, Hyder AA, Akther M. Globalization: towards a new framework for public health. Social Theory and Health2003;1:91–107. Marmot MG, Davey Smith G, Stansfeld S, et al. Health inequalities among British civil servants: the Whitehall II study. Lancet1991;337:1387–93. Siegrist J, Starke D, Chandola T, et al. The measurement of effort-reward imbalance at work: European comparisons. Soc Sci Med2004;58:1483–99. Niedhammer I, Siegrist J, Landre M, et al. Etude des qua-lités psychométriques de la version francaise du modèle du des équilibre efforts/récompenses. Revue Epidémiol Santé publique2000;48:419–37. Bosma H, Peter R, Siegrist J, et al. Two alternative job stress models and the risk of coronary heart disease. Am J Public Health1998;88:68–74. Godin I, Kittel F. Differential economic stability and psychosocial stress at work: associations with psychosomatic complaints and absenteeism. Soc Sci Med2004;58:1543–53. Marmot MG, Elliott P, eds. Coronary heart disease epidemiology. Oxford: Oxford University Press, 1992. Rose G, Wright DD, Hamilton TS, et al. Myocardial ischemic risk factors and death from coronary heart disease. Lancet1977;i:105–9. Karasek R, Brisson C, Kawakami N, et al. The job content questionnaire (JCQ): an instrument for internationally comparative assessments of psychosocial job characteristics. J Occup Health Psychol1998;4:322–55. Pikhart H, Bobak M, Siegrist J, et al. Psychosocial work characteristics and self rated health in four post-communist countries. J Epidemiol Community Health2001;55:624–30. Niedhammer I, Teck ML, Starke D, et al. Effort-reward imbalance model and self reported health: cross-sectional and prospective results from the GAZEL Cohort. Soc Sci Med2004;58:1531–41. Ostry AS, Kelly S, Demers PA, et al. A comparison between the effort-reward imbalance and the demand control models. BMC Public Health2003;3:10–21. Theorell T, Hallqvist A. Decision latitude, job strain, and myocardial infarction: the study of working men in Stockholm. Am J Public Health1998;88:382–8. Amick BC, McDonough P, Chang H, et al. Relationship between all-cause mortality and cumulative working life course. Psychosocial and physical exposures in the United States labor market from 1968 to 1992. Psychosom Med2002;64:370–81. Godin I, Siegrist J. Cumulative work stress exposure and mental health: prospective evidence from the Somstress Study. Submitted. Chandola T, Kuper H, Singh-Manoux A, et al. The effect of control at home on CHD events in the Whitehall II study: gender differences in psychosocial domestic path-ways to social inequalities in CHD. Soc Sci Med2004;58:1501–9. Lee S, Colditz G, Berkman L, et al. A prospective study of job strain and coronary heart disease in US women. Int J Epidemiol2002;31:1147–53. Hall EM, Johnson JV, Tsou TS. Women, occupation and risk of cardiovascular morbidity and mortality. Occup Med1993;8:709–19. Weidner G, Kopp M, Kristenson M, eds. Heart disease: environment, stress and gender. Amsterdam: IOS Press, 2002. Peter R, Siegrist J, Hallqvist J, et al. SHEEP Study Group. Psychosocial work environment and myocardial infarction: improving risk estimation by combining two alternative job stress models in the SHEEP study. J Epidemiol Community Health2002;56:294–300. Spector PE, Zapf D, Chen PY, Freese M. Why negative affectivity should not be controlled in job stress research: don’t throw out the baby with the bath water. Journal of Organizational Behaviour2000;21:79–95. Stansfeld S, Bosma H, Hemingway H, et al. Psychosocial work characteristics and social support as predictors of SF-36 functioning the Whitehall II Study. Psychosom Med1998;60:247–55. Stansfeld S, Fuhrer R, Shipley MJ, et al. Work characteristics predict psychiatric disorder: prospective results from the Whitehall II study. Occup Environ Med1999;56:302–7. van Vegchel N, Jonge J de, Bakker AB, et al. Testing global and specific indicators of rewards in the effort-reward imbalance model: does it make any difference? European Journal of Work and Organizational Psychology2002;11:403–21. Vrijkotte TGM, van Doornen LJP, de Geus EJC. Effect of work stress on ambulatory blood pressure, heart rate, and heart rate variability. Hypertension2000;35:880–6. Siegrist J, Peter R, Junge A, et al. Low status control, high effort at work and ischemic heart disease: prospective evidence from blue-collar men. Soc Sci Med1990;31:1129–36. Kuper H, Marmot M. Job strain, job demands, decision latitude, and risk of coronary heart disease within the Whitehall II study. J Epidemiol Community Health2003;57:147–53. McLeod J, Smith GD, Heslop P, et al. Are the effects of psychosocial exposures attributable to confounding? Evidence from a prospective observational study on psychological stress and mortality. J Epidemiol Community Health2001;55:878–84. Lynch J, Krause N, Kaplan GA, et al. Work place conditions, socioeconomic status, and the risk of mortality and acute myocardial infarction: the Kuopio Ischemic Heart Disease Risk Factor Study. Am J Public Health1997;87:617–22. Aust B, Peter R, Siegrist J. Stress management in bus drivers: a pilot study based on the model of effort-reward imbalance. Int J Stress Management1997;4:297–305. Ethical clearance: Ethical approval for the Whitehall II study was obtained from the University College London Medical School Committee on the ethics of human research. The Whitehall II study participants gave written, informed consent, and the manuscript conforms to the principles outlined in the Declaration of Helsinki.